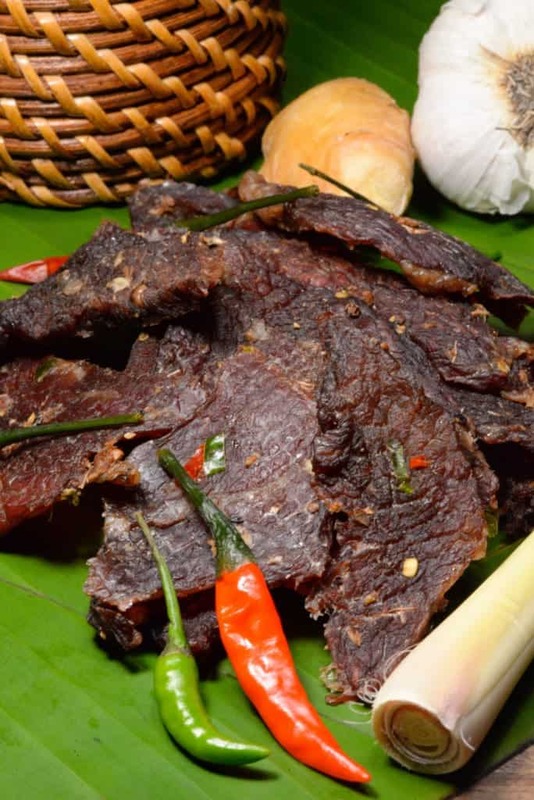 Laotian beef jerky is a spicy treat that embodies the flavors of Laos. It is very easy to make. 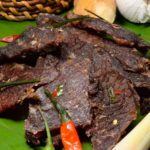 I read stories about how kids in school in the USA would happily trade with a Lao friend their lunch boxes, as everyone loved the beef jerky and sticky rice more than their peanut butter and jelly. Please note this post contains an affiliate link in which I may earn a small commission, however it does not affect the price you pay. A delicious snack anytime. It is made with the flavors of Lao, you will love it. Combine all the ingredients except the meat in a bowl and mix well. Put the meat in the bowl and coat it well. Put the meat and remaining marinade in a ziploc bag and allow it to marinate overnight. Alternatively you can place in an oven with the door slightly ajar at 250 degrees until done.